For the members of Breckenridge High School’s golf team, this spring has been anything but boring. 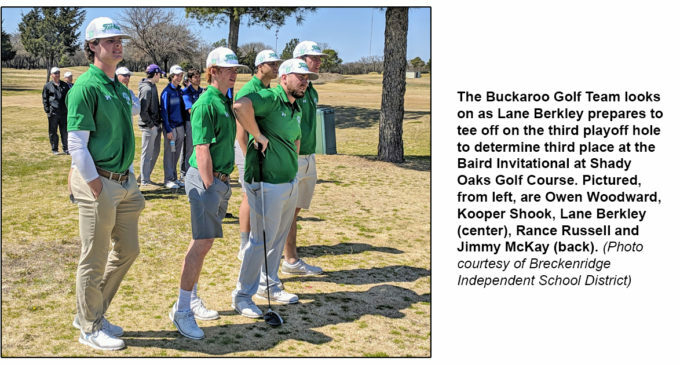 In addition to spending time competing in basketball, baseball, track and field, and stock shows, the five members of the Buckaroo golf team have been preparing to capture glory on the course, according to a news release from Breckenridge Independent School District. The golf season teed off in January with the Flower Mound Invitational at Tour 18 Golf Course in Flower Mound. The members of the team braved chilly winds and a very long course to start the year off with a great day on the links. Senior Lane Berkley ended the day tied for first place with a score of 79, but was named the tournament runner-up after a scorecard playoff. The team as a whole competed very well against many Metroplex-based teams, including several from 6A high schools. The team again played on a cold, windy day at the Millsap Invitational at Sugartree Golf Course outside of Lipan and Brock. The results from this tournament, however, warmed their spirits as Lane Berkley captured first place with a round of 77. Senior Rance Russell took second with a score of 80, and the boys team decisively won the team gold medal. Other team members are senior Jimmy McKay, and juniors Owen Woodward and Kooper Shook. Shady Oaks Golf Course hosted the Baird Invitational, the Buckaroos’ the third tournament of the year, which brought an exciting finish. The entire team improved their scores from the last tournament but found themselves out of the team medal race. Rance Russell finished with a 76, good for second place individual, but the fight for third place captured the excitement of several golf teams in attendance. A three-way tie for third at 79 between Lane Berkley and golfers from Clyde and Jacksboro led to a tense playoff after tournament play ended. All three young men easily shot par on the first playoff hole. Breckenridge’s Berkley scrambled to match the scores of the other two competitors, who both missed short putts that could have sealed the win. Going to the green of the third playoff hole, it looked like Berkley would have an easy victory after placing his approach shot about six feet from the pin. However, the young man from Jacksboro drained a 40-foot putt for birdie to seal the win, prompting a rousing applause from the large gallery of other teams, but it unfortunately relegated Berkley to fourth place. The BHS Golf team looks to improve again with their final pre-district tournament, the Brock Invitational in Weatherford at Canyon West Golf Course on March 25. Canyon West will also host the district tournament on Wednesday, April 3. The top two teams and top two individuals (from non-advancing teams) will advance from district to the regional tournament to be held in late April at Shady Oaks in Baird. The state golf tournament will be hosted in May at Grey Rock Golf Club in Austin.